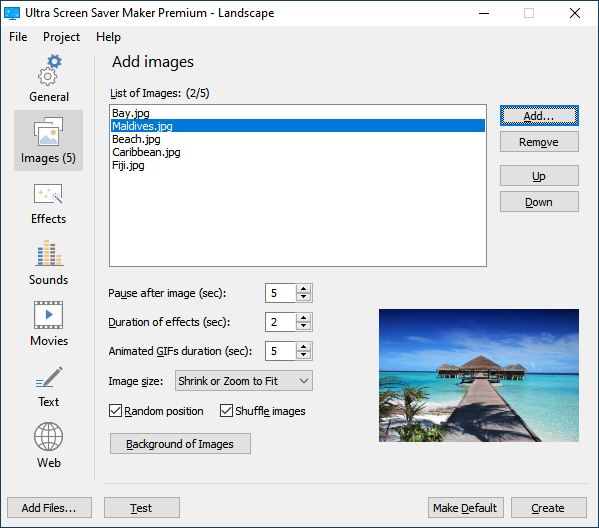 Create a screensaver with images, sounds, movies, Flash and text in 10 seconds! Changes: Version 3.6 has redesigned user interface, icon and installation wizard image. Provided that you verify that you are distributing the Shareware version you are hereby licenced to make as many copies of the Shareware version of this software and documentation as you wish; give exact copies of the original Shareware version to anyone; and distribute the Shareware version of the software and documentation in its unmodified form via electronic means. There is no charge for any of the above. END-USER LICENSE AGREEMENT FOR THIS SOFTWARE IMPORTANT - READ CAREFULLY: This End-User License Agreement ("EULA") is a legal agreement between you (either an individual or a single entity) and FINALHIT LTD, which includes computer software and may include associated media, printed materials, and "online" or electronic documentation ("SOFTWARE PRODUCT").